Call it what you like! A Dog Vehicle Safety Belt, a K9 Auto Tether, or a dog seat belt - it just makes sense to have one for your dog. Securing your dog in your car makes sense for many more reasons than just avoiding a ticket! A Vehicle Safety Belt actually prevents accidents. Most dog/car accidents are caused by a dog that distracted the driver. Many dogs are like jumping beans in the car. They jump from seat to seat or they pace back and forth. A dog seat belt is for them. And most importantly - if you are in an accident, and a rescuer opens your door to get you out - your loose dog is likely to run out of the car - and into traffic…or just away. Neither situation is good. And both can be avoided, with a dog seat belt. Lastly, Yes…Police are now ticketing for having a loose dog in the car. Some states have specific animal tethering regulations for vehicles. Yet, police in any state can write a ticket for an untethered dog in the car under general 'Distracted Driver' or "Improperly Transporting An Animal" provisions. Call it what you like! 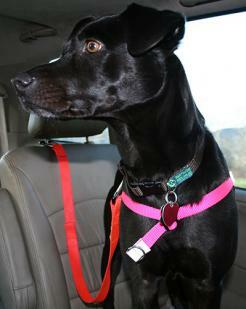 a dog vehicle safety belt, a K-9 auto tether, or a dog seat belt - it just makes sense to have one for your dog. © 2007-2019 Walk Your Dog With Love. All Rights Reserved.